Angelo is an independent researcher involved in research on Uganda’s oil sector. Research interests include extractives, governance and minorities; extractives and regional security; political settlements and oil. Angelo is currently providing research support to Prof Sam Hickey on the comparative Ghana/Uganda study of political settlements in newly oil-producing African nations. He is specifically working on understanding Uganda’s oil players and energy sector contracts, including their oil footprint. 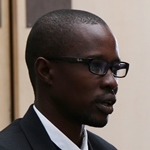 Angelo is also a Ugandan journalist and blogger. View his articles on African Arguments.